Pulmonary congestion is not a classic symptom of subjective, but rather a sign of a disease on chest radiograph, which alerts the clinician to either lung disease or heart. However, it may manifest dyspnea and bloody sputum secretion. Technically this phenomenon called pulmonary congestion (stasis of blood in the lungs). 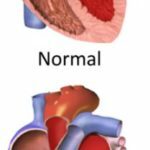 It may mean that the heart can not handle pump blood into the large circulation and it then accumulates in the small circulation – in pulmonary vessels. These radiographic appears to be widespread, highlighted. When judgment is advanced to pulmonary edema (pulmonary edema when the fluid passes from the blood vessels into the lung tissue). Such heart failure are often elderly people from various causes (degenerative valvular defects, heart attack, high blood pressure, …) or even small children from birth if they have some developmental heart defects often more serious nature. At other times, however, slight pulmonary congestion may not immediately manifest dyspnea and patient about it to know himself. Pulmonary congestion can of course be a sign of lung diseases (e.g., chronic bronchitis,emphysema, asthma, …). During prolonged cough (especially if the mucus contains an admixture of blood) or breathlessness definitely see a doctor, it is already a more advanced stage of disease.